← Fred Caruso: Thank God I’m alive! 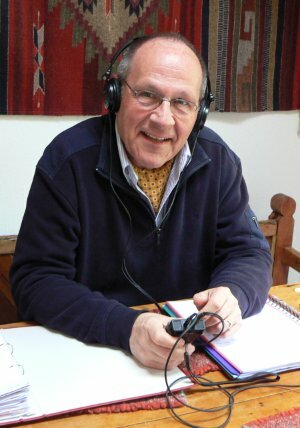 Peter Frey is presently working on a radio documentary series for the German language division of the Swiss National Public Radio system. He recently interviewed five persons involved in the ditching 50 years ago, all on their home turf: They are Pierre-Andre Reymond, Celerina Crew (Switzerland); Fred Caruso, a surviving paratrooper (Ireland); Carol Ann Gould Hansen, the only surviving flight attendant (New Jersey); Sammy Vasquez, a surviving paratrooper (Arizona), and Arthur Gilbreth, also a surviving paratrooper (Oregon). The programs will be aired in German language. Postings can be found on all of those listed on this website. Frey is a Super Constellation enthusiast and is involved in a club that played a significant part in the restoration of the Breitling watch company aircraft. You will see many examples of Super Constellations around the world and the movement to restore them. This link will take you to more information on the scope of Super Constellation restoration. This entry was posted in Uncategorized and tagged Super Constellation. Bookmark the permalink. I am the photographer of the N6923C. As Peter Frey mentioned, I don´t claim any copyright, but I ask to be mentioned as photographer. It is a strange feeling to know that “our” Super Connie ditched a year later. After fuelling at Shannon, Irteland, we continued but had to land at Gander as the whole Eastern seaboard was closed due to fog. Somewhat delayed, we arrived at Idlewild. As our study tour was a success, I was asked to arrange some more tours the following years, and in June 1962 we had another Super Connie chartered and a year later also. When I first heard of the Flying Tiger Line, it was in a small notice in a newspaper. It said that Flying Tiger had passengers from the US to Europe in the beginning of the summer and vice versa at the end of the summer. They offered cheap charter flights from Europe in the beginning of the summer and back at the end of the summer to fill otherwise empty planes.